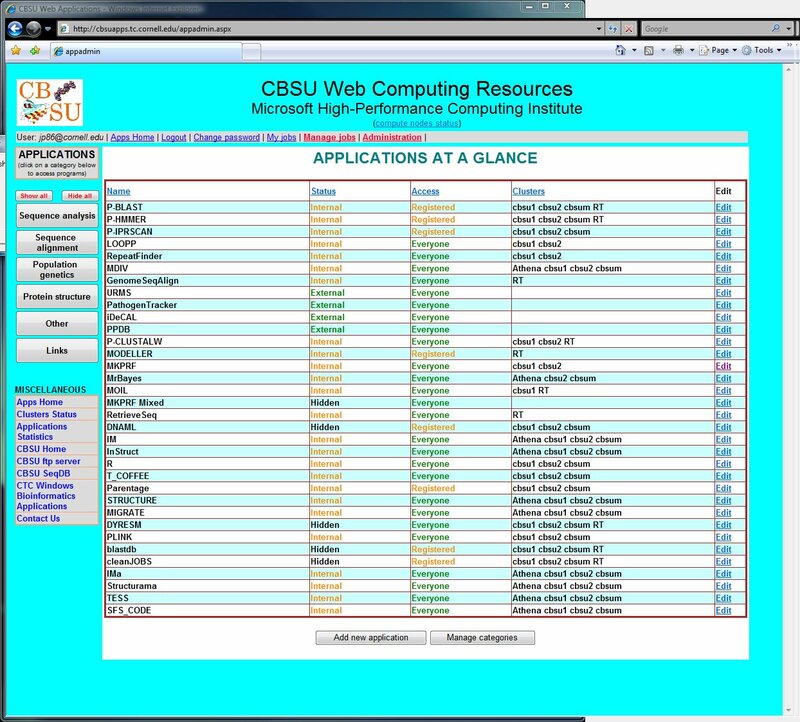 BioHPC has a web-based administration of users, jobs, applications, and clusters within the suite. Virtually all the administration tasks can be done directly from the interface. 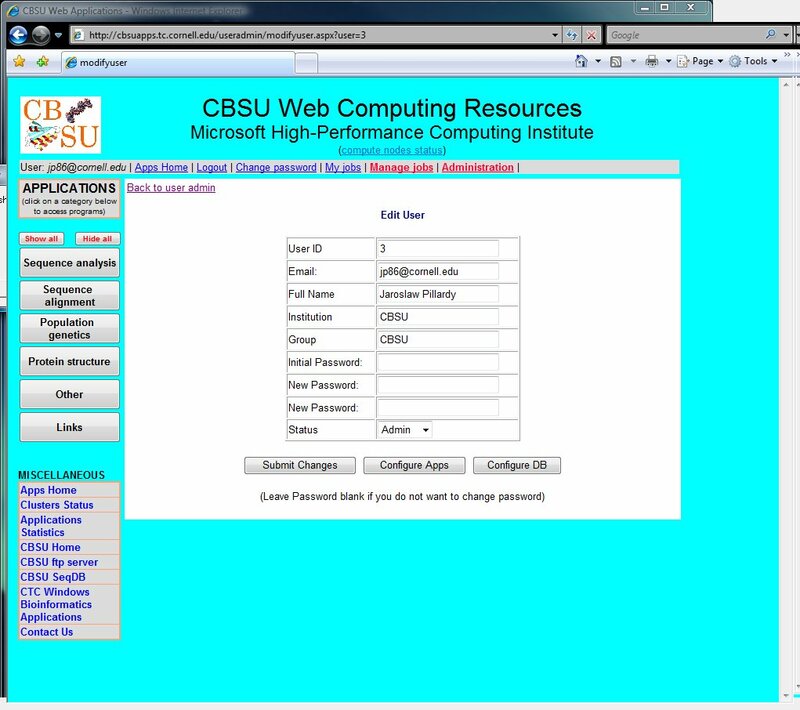 Any number of users can be designated as administrators, after login they can access red administration links from the horizontal menu bar. 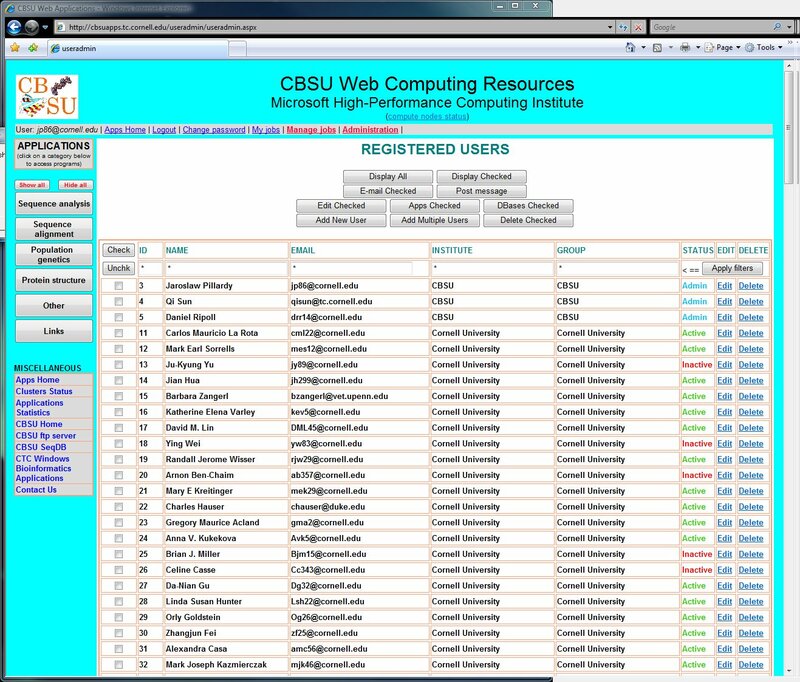 Main administration page contains links to all other pages: managing jobs, users, applications, clusters, files, BLAST databases and real-time scheduler. 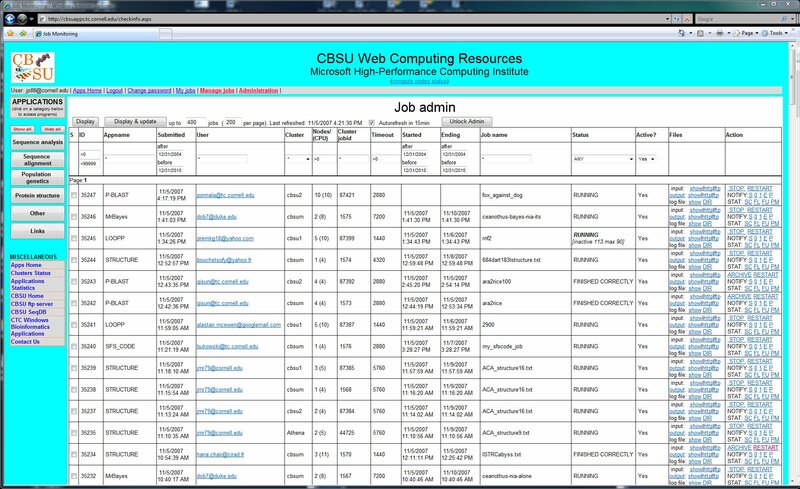 Job administration page provides an access to all the active jobs (queued, running or finished) on all clusters (see on the left). At the bottom of the page there is one more list of jobs, but this time grouped by clusters. Administrator can access jobs' files, stop, restart and move jobs between clusters. It is also possible to change job's status or send a user standard message (starting, failed etc). Jobs can be grouped by selecting their checkboxes and then operations can be carried out on the job groups with one click. It is very versatile administration page, and also the one used most often. Please refer to the documentation for detailed instructions. Applications can be accessed from the overview page providing links for editing various parameters on each application control page. There are many parameters that can be adjusted like maximum number of jobs per user (guest or registered), preferred cluster, number of CPU to be used per node (per cluster) and job timeouts (per cluster and user). Applications can be also put in maintenance mode and made inaccessible for users. This mode can be used for debugging, maintenance or developing. BLAST requires a set of databases, some of which must be stored locally on the nodes. It is possible to control these databases, define them, trigger update or copy from network drive to local storage on the nodes all from BLAST database maintenance pages. 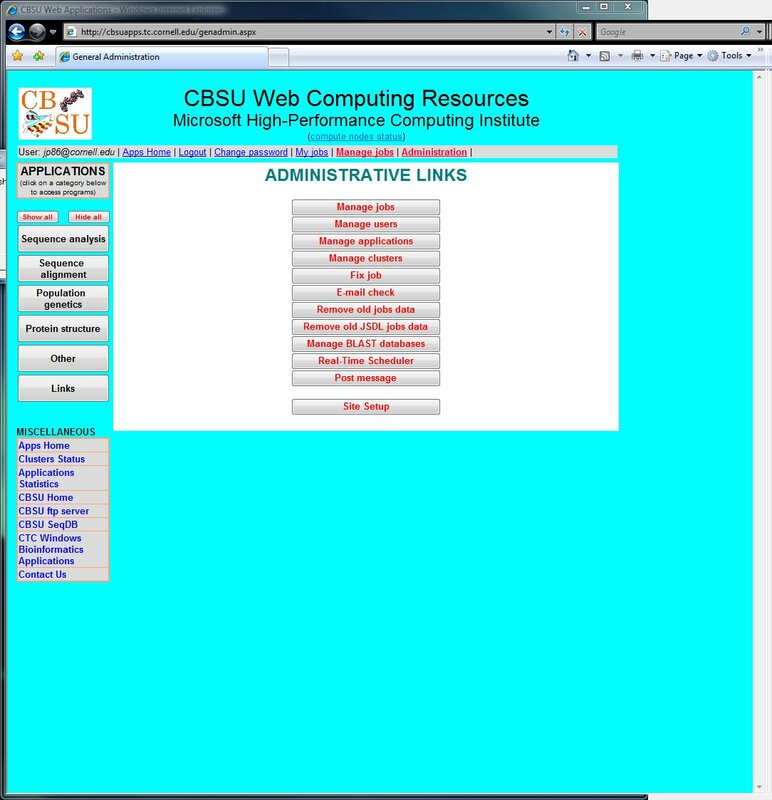 There is an extensive set of pages devoted to user administration. 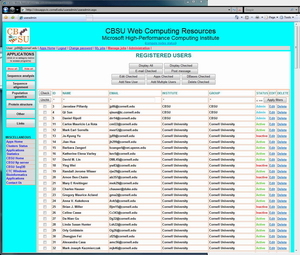 Main page provides list of all users with links to pages for setting user account details, database access rights or applications access rights. It is possible to select groups of users and perform administrative tasks on them together, it is also possible to use filters to select only users with certain properties. Cluster administration is handled by another set of pages. 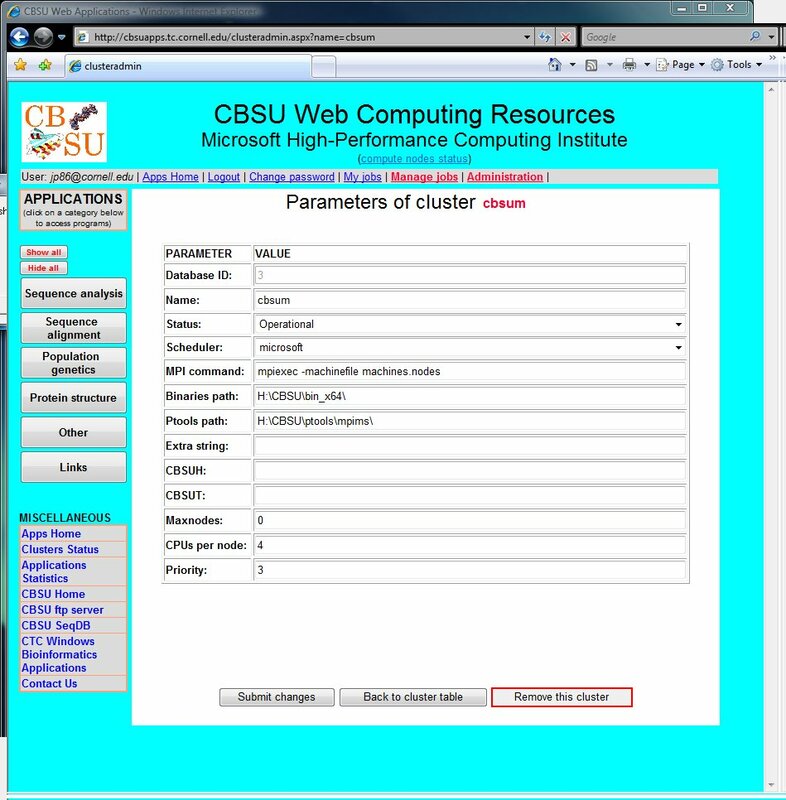 Main clusters page list all the common properties of all clusters with links to cluster parameters pages. There are many parameters governing clusters in BioHPC suite like number of CPUs per node, scheduler, local storage and more. Cluster status can be changed from this page in order to carry maintenance tasks or remove the cluster from the common pool. Files from jobs are stored on network drive as well as on (optional) ftp server. Old jobs' files can be deleted from files administration page after reviewing the jobs' ages statistics. 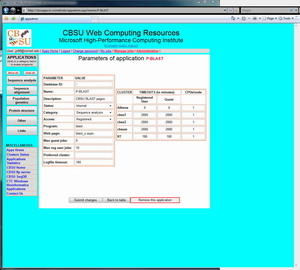 Optional real-time scheduler can also be controlled from a separate web page. 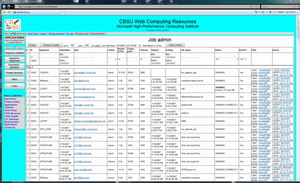 This scheduler is independent of other clusters/schedulers and can be installed on any computer in the domain for use with serial jobs. Remote cleanup of a JSDL cluster can be carried out from JSDL files cleanup page.